A recurrence is one definition of repetition. 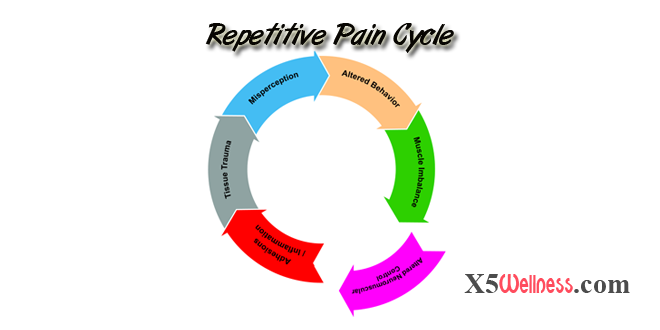 Often we think about recurrence in a negative context like repetitive motion injury with a subset of repetitive strain injury. Psychology and medical texts are filled with thousands of names for diseases and injuries related to repetitive patterns. The term “chronic” itself implies recurrence. Try to find an antonym for the word injury or any of the chronic diseases, and you’ll find an incredible shortage. It amazes me that we can in clear, concise terms define thousands of illnesses, and we only have a handful of words to describe states of wellness. We even go so far to define wellness in terms of absence of disease. I mentioned to a friend lately that defining wellness in terms of absence of illness is similar to saying that since I am not in hell, I must be in heaven. Not being sick is not the same as being well. Not being weak is not the same as being strong and so on. However, the opposite is not true. Being well does mean that you are not sick. Being strong does mean that you are not weak. Do you wish “not to be sick” or you you want to be “well”? Do you wish “not to be weak” or do you want to be “strong”? To find solutions to these questions, many claim that knowing the cause helps changing those behavior that sustain a repetitive experience. They keep asking “why” questions. I have seen only a handful of cases, outside of research, that knowing a cause of a recurrence helped prevent it. Addictions, heart disease, diabetes and obesity cover more than 75% of the population. The nutrition connection to every one of these chronic conditions is well documented and does not help more than 2/3 of the population who are struggling with them. The same types of statistics exist in personal developments as well as personal and professional relationships. Instead of asking why I am at point “A” of a recurring experience, I choose to ask how I can get from point “A” to point “B.” “How to” is a much more effective question to ask than “why”? We excel through repetition. We can excel in being destructive or constructive by repetition. In training, especially related to corrective and functional training exercises, I focus on asking “How to” and “what to do” questions similar to the ones you see below. What am I repeating? A weekly written record could be very revealing. Don’t forget to include repetitive thoughts and feelings that drive actions. What do I excel at by repeating certain events and actions? Remember that you always excel through repetition. You just may not excel at something you like. Am I content with my type of excellence? Contentment is a stable long-term state of being not to be confused with immediate gratification which depends on brain chemistry. What steps do I know that I can take to change what I repeat? There are usually dozens of simple steps you can take to break the cycle of repetitions. The interest to look for these solutions, , find them and implement them must come from you. If someone revealed the solutions or even gave them to you, I am sorry to say, that you would likely ignore them or reject them. Assuming that I did change what I repeat, will I reach a different destination? Before you put the effort in changing something, use your imagination and see if the completed change will actually take you to a different destination. If it does not, chances are that you are repeating the same step disguised as a different one. Will I be content with that destination? This is an incredibly powerful question to ask. I have spent thousands of hours to master very specific skills. Once I reached mastery, I realized that I was not content, and I started over. After I began asking this question, I realized many of the repetitive actions I was doing, and their alternatives that I was planning to do did and would not take me to a place of contentment. Only then, I began to focus on mastering an entirely different sets of skills. These are alternative ways of asking questions and getting away from the “Why” questions. By the simple act of asking different types of questions, you could move beyond recurring events and actions and the repetition definition of recurrence. Adversity: "The most beautiful people are those who have known defeat, known suffering, known struggle, known loss, and have found their way out of the depths.